The information on this page applies only to the Windows release of Krita 3.1 Beta 3 (3.0.92) and later. There are some additions to Krita which makes getting a backtrace much easier on Windows. When there is a crash, Krita might appear to be unresponsive for a short time, ranging from a few seconds to a few minutes, before the crash dialog appears. If Krita keeps on being unresponsive for more than a few minutes, it might actually be locked up, which may not give a backtrace. In that situation, you have to close Krita manually. Continue to follow the following instructions to check whether it was a crash or not. Open Windows Explorer and type %LocalAppData% (without quotes) on the address bar and press Enter. Open the file with Notepad and scroll to the bottom, then scroll up to the first occurrence of “Error occurred on <time>” or the dashes. Check the time and make sure it matches the time of the crash. 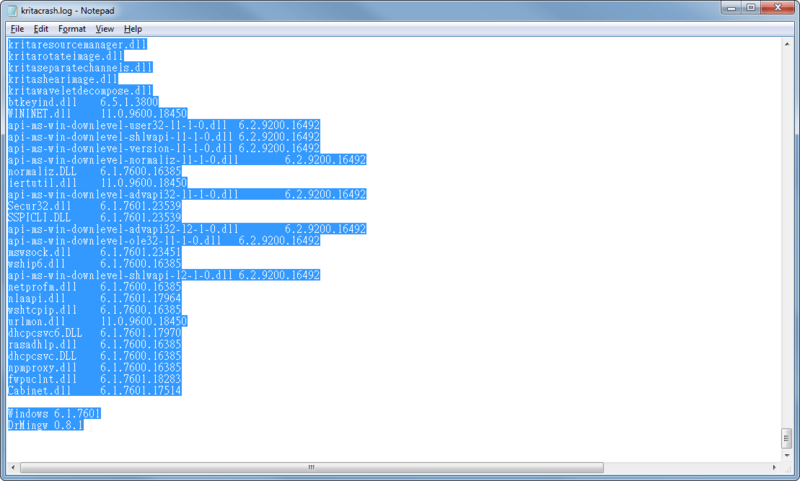 The text starting from this line to the end of the file is the most recent backtrace. If kritacrash.log does not exist, or a backtrace with a matching time does not exist, then you don’t have a backtrace. 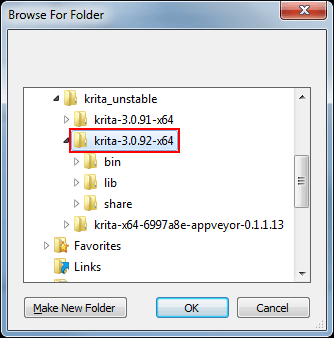 This means Krita was very likely locked up, and a crash didn’t actually happen. In this case, make a bug report too. If the backtrace looks truncated, or there is nothing after the time, it means there was a crash and the crash handler was creating the stack trace before being closed manually. 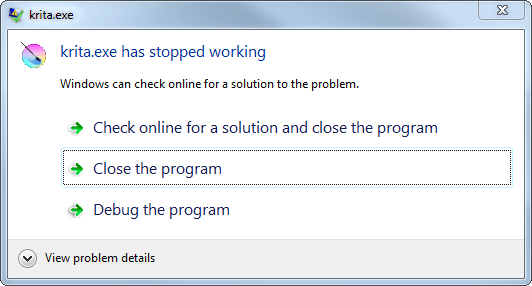 In this case, try to re-trigger the crash and wait longer until the crash dialog appears. 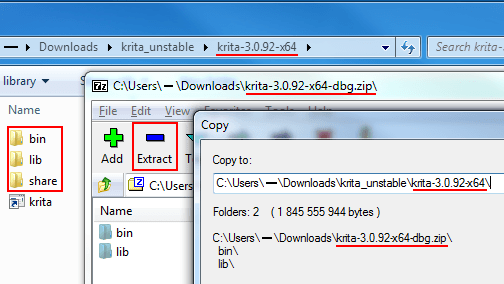 Starting from Krita 3.1 Beta 3 (3.0.92), the external DrMingw JIT debugger is not needed for getting the backtrace. Links to the debug packages should be available on the release announcement news item on https://krita.org/, along with the release packages. You can find debug packages for any release either in https://download.kde.org/stable/krita for stable releases or in https://download.kde.org/unstable/krita for unstable releases. Portable zip and debug zip are found next to each other. Make sure you’ve downloaded the same version of debug package for the portable package you intend to debug / get a better (sort of) backtrace. 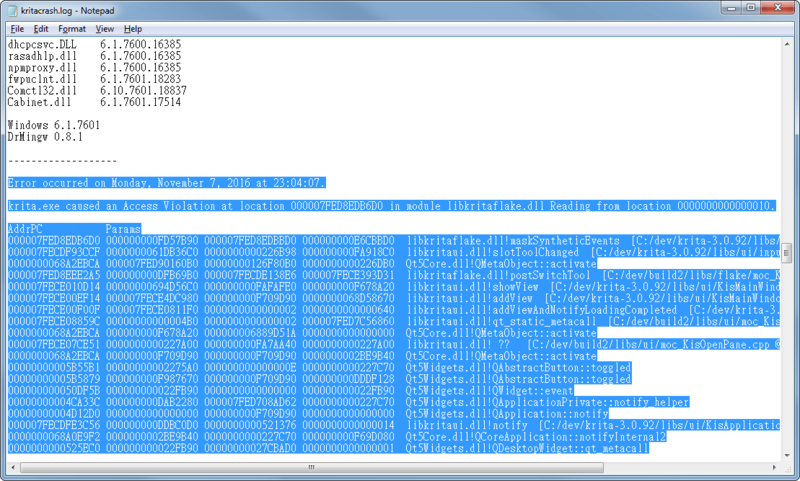 After extracting the files, check the bin dir and make sure you see the .debug dir inside. If you don’t see it, you probably extracted to the wrong place.